We offer an assortment of air receivers like vertical air receivers, compressed air receivers, standard air receivers, etc., that are applicable in diverse industries and help in the maintenance of the air pressure to create a comfortable atmosphere. Available in customized specifications, these air receivers are offered at industry leading prices. 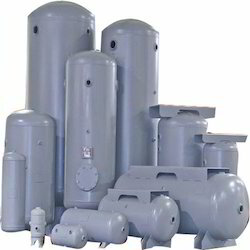 Backed by rich industry experience, we are presenting vast variety of Horizontal Air Receiver Tanks. 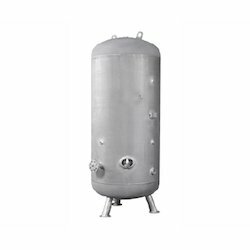 The offered range of horizontal air receiver tanks is highly recommended in the industry, owing to its durability, easy maintenance, and reliable operation. Customized on sizes, volume and shapes, this range enables to separate oil & moisture from compressed air. 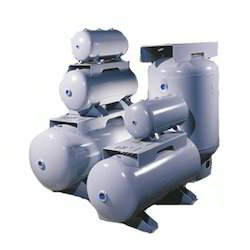 Also, this range cools the compressed air and aids in maintaining the constant pressure at downstream. Utilizing the laid pipelines, this range of Horizontal air receiver tanks is displaced to different sections of the factory. We are able to come up with an extensive and an unparalleled range of Vertical Air Receiver. These vertical air receivers offered by us are ideally applicable for condensing the moisture as well as Storage of Air and Gas. Our deft personnel ensures to design the offered range in tandem with the relevant volumetric standards as per the pressure air tanks. This range is known for its features such as high performance, durability, and dimensional accuracy. We have established ourselves as a renowned manufacturer and supplier of Air Receiver Tanks. The offered range of air receiver tanks is available to clients in different specified grades and capacities with respect to the emerging requirements of the clients. 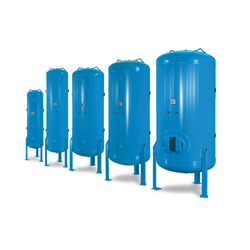 This range of air receiver tanks is known for its usage in decreasing the repetitive cycling and pulsation of the compressor operation. Applicable in both domestic and industrial fronts, this range is known for its effective performance and durability. We are highly praised in the market as one of the prominent manufacturer and supplier of Stainless Steel Air Receiver. Our product is highly efficient for storing compressed gas and air in the industrial plant from where it is transported to different sections of the industrial unit through lay pipelines. It is developed from premium quality raw materials and therefore is free from any kind of fissure. The products effectively seal the air and prevent leakage. Looking for Air Receiver ?